We had the opportunity to review the Sands Alive Set from Play Vision. We have had the pleasure of a Sands Alive Kit in the past, and these are super cool sets that the kids love playing with. My kids can spend whole evenings playing with theirs. The Sands Alive set is a moldable, ultra smooth and soft sand that glows in the dark. This is the very first sand ever made to glow in the dark. 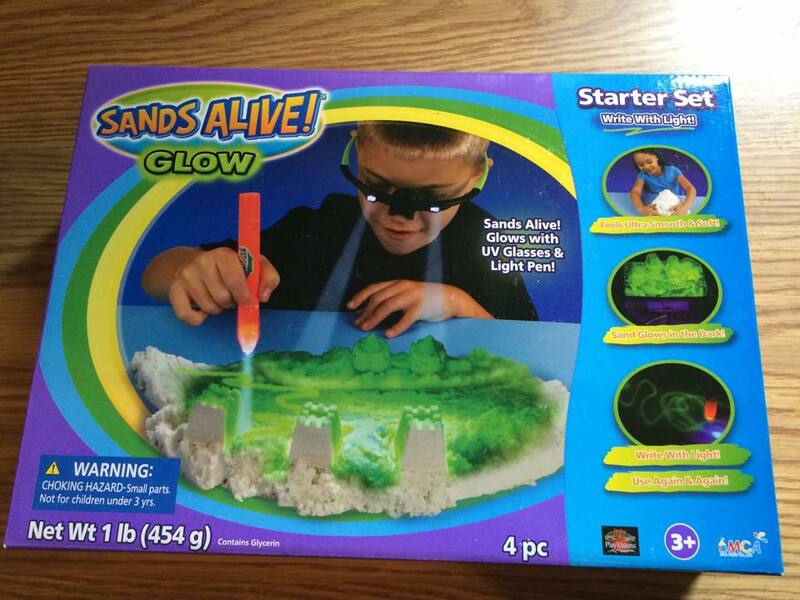 Included with the set are UV glasses, UV Pen Light, Play Tray, and one pound of glow sand. This set is recommended for children ages 3+. Like I stated above this sand is super cool and very popular at my house. Not only the kids love it but I love it as well. There is nothing to mix, this does not make near as much of a mess as play dough.In my book I would call it a mess free activity. The kids really like how the sand glows in the dark. Glowing sand was an exciting new concept to them. They can sit for long periods of time making pictures, shapes, letters their names. They play tic tac toe using the glow sand. What child could not think "awesome" after seeing how the glow sand reacts to the UV pen Light and glasses? The Sands Alive can be a great tool for kids who have sensory issues as well. Our son has issues with all five of his senses. Either he is bothered by things in a very good way, or he has quite the opposite reaction and it's very bad. This kit has been a good thing, I think he really likes the texture of the sand. Sands Alive is a mess free affordable way to provide children with hours of fun play! You can connect with Sands Alive via: Facebook and Website . This is really cool and looks like hours of fun. My son would have loved this when he was younger. MY GRANDDAUGHTER WOULD LOVE THIS FOR A CHRISTMAS PRESENT THANKS FOR SHARING THIS GREATLY APPRECIATED SOUNDS AWESOME THANKS. A Fitbit is number one on my list this year. Thank you so very much for this giveaway. Wow, this is so cool. My grandson would love this. This looks so awesome! My son love sand sets, he'd have a blast with this! This is so cool! It seems like a great toy!